What qualities are missing in our homes? How can we regain them? 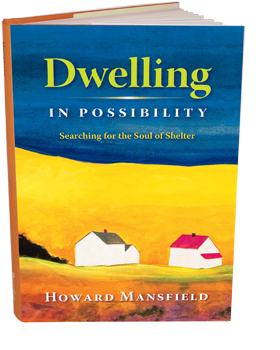 Dwelling in Possibility is a search for what makes some houses a home, and some public places welcoming. Howard Mansfield looks at things that were once ordinary in the home, like the hearth and rooms without clutter, and he looks at homes swept away by disasters and war. He visits a relief effort in the long aftermath of Hurricane Katrina to get a sharper sense of the fragility of our dwellings and our strong commitment to making a home. He confronts the legacy of the World War II firebombing campaigns that left Europe in ruins and gave rise to three distinctly different writers who sought to restore the sanctity of home. On footpaths and in the hidden lives of many sheds, Mansfield courts the spirit of good places that Christopher Alexander calls “the quality without a name.” We can recognize this elusive quality, and yet we find it very difficult, if not impossible, to create this feeling in our new houses and in our towns and cities. Mansfield invites us to travel across time, geography and culture before delivering us—wiser and more thoughtful—to the full-of-meaning place we call home.